1st Stage: Sediment Filter 5 Micron; Remove sediment, suspended particles, colloid, rust, sand, color, bacteria, heavy metal, chlorine, smell, etc. 2nd Stage: Coconut Shell Carbon Block GAC Filter 5 Micron; Remove chlorine, pesticide, color, smell, VOC, THMs, bacteria, etc. 4-Stage: Post Activated Carbon Filter: Improve water taste. Lead-Free Faucet----High Quality Copper Base; Brushed Electroplating; 360 Degree Rotation Design; Easy-to-Operate Single Handle Switch; High Quality Ceramic Valve Core. 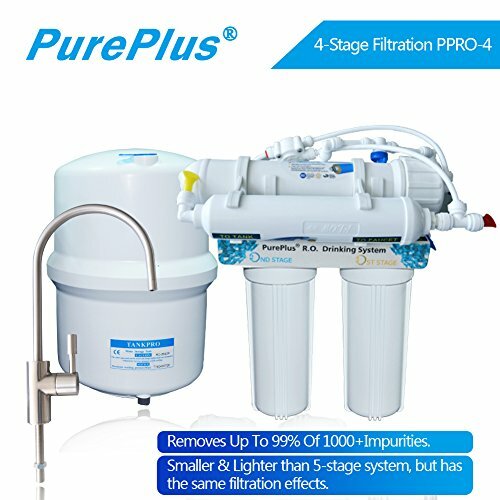 Filters 1,000+ water pollutants including common adversaries, chlorine, fluoride, heavy metal, bacteria and more. All the filters are certified by WQA to NSF 42 and NSF 372 standard. LG RO membrane is NSF 58 certified by NSF. Detailed instruction manual inside with Youtube DIY instruction video sent to you. If you have any questions about this product by Pureplus, contact us by completing and submitting the form below. If you are looking for a specif part number, please include it with your message.